There was quite a wide range of bread eaten in medieval times. It was the main staple food in the diet of people both rich and poor. However, it is hard to find a 100% definitive recipe that has been passed down directly from that period. History sources such as Chaucer’s “Canterbury Tales” act as some of our best guides and references on medieval food. Chaucer’s miller, for example, made reference to a variety of bread names and how they were eaten. 1. 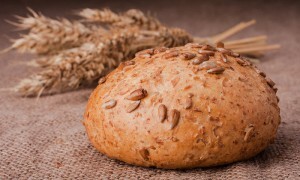 Ale-barm was used for raising the dough; its equivalent today would be brown ale + fresh yeast. The most popular way of baking bread was done by the poor. Peasants would take their usually meagre amount of grain and grind it by hand in a wooden mortar or a stone trough. They would then mix it with water and bake what was known as unleavened bread (or oatcakes). The baking was done by placing the dough under an upturned pot placed on the ‘down-hearth’ – this was the flat stone in the centre of the floor of their one room hut on which the fire was built. The embers would keep the stone hot for some time so it was ideal for baking in this way. In some towns and village the bakers would bake bread to supply the local people as well as baking for their own families. If a baker had a good reputation, they might find themselves baking in a medieval castle kitchen exclusively for a rich noble, his family, guests and servants. 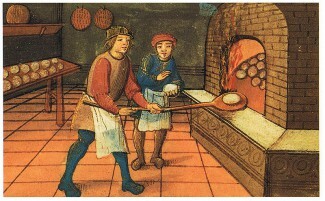 The photo (right) gives an idea of how a baker might have been seen working in a castle kitchen. Notice the method being used to remove the baked bread from the hot oven – a long stick with a flat round end. Made of clay or wood this was called a peel. Peels are still used today although they tend to be made of metal and the most common place to see them is in pizza parlours for removing freshly cooked, hot pizzas from the oven. You can read more on my medieval bread page. If you enjoy baking and have yet to try making anything with an old fashioned recipe, you could consider baking a medieval style bread using today’s ingredients. I have a recipe for medieval style oatcakes (photo) and one for barley bread. These recipes should help you, your friends and family to enjoy a taste of a bygone age.